There are several types of cat toy available, and many different varieties so it can be quite hard to find the best one. 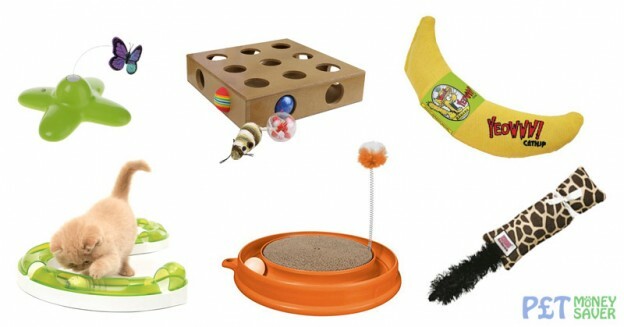 We have researched many of the different toys available, and put together this list of 15 of the best cat toys you can buy in the UK. Click here to jump straight down to the cat toy reviews! A cat’s natural behaviour is to watch, chase and pounce – so toys that help them mimic this will provide the most enjoyment. 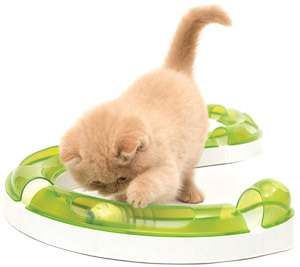 Toys that offer rapid, unpredictable movements are usually the best choice to keep your cat entertained. Flashing lights and high-pitched sounds can also make a toy more attractive to a playful cat. Cats often like to pick up their toy and often carry it to a safe location. This mimics their behaviour when they catch prey, and means smaller toys are usually preferable to larger ones. In the wild, a cat would eat their prey after catching it – so mimic this with your play time by giving your cat a tasty treat at the end of it, once they have “captured” their prey. This will both mark the end of the session, and help your cat feel like they’ve achieved something. These are designed for you to play with your cat, for example laser pointers or “fishing rod” type dangly toys on a wand. A top tip is to always keep these out of reach of your cat when you’re not playing with them. There is a safety risk they could choke or get tangled up in the strings when you’re not around. Also it helps keep the toy fresh and exciting if it’s only used at certain times. The wand type toys allow you to swoosh the toy through the air. This helps give these toys a more natural appearance, which appeals to your cat’s hunting instinct. A cat will usually spend time watching their potential prey before pouncing, so if your cat doesn’t appear interested at first it may just mean they are waiting for the best moment to pounce on the toy. Another advantage of the wand-type toys is that it keeps your hands away from your cat’s sharp claws when they pounce and bite. This also means your cat doesn’t learn to associate grabbing your hands or feet with playtime. Adding food to your cat’s playtime will add an extra element of fun and interest for them. Puzzle feeders are designed to encourage an inquisitive cat to solve puzzles or play with the toy to provide a little treat. These can range from a simple rolling ball that dispenses treats when it’s rolled in a certain position, to more involving fixed puzzles. Some cats will enjoy the challenge of solving the more complex challenges, while others will become bored and frustrated. 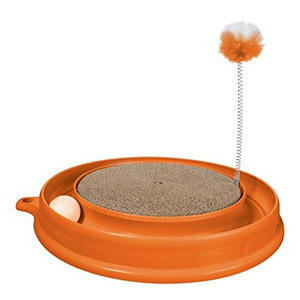 Feeder toys that are adjustable are ideal so you can set them to the appropriate difficulty for your cat. One of the most popular cat toys is the good old mouse toy. These have quite a few varieties – from furry toys that look like a real mouse, to colourful mice with flashing lights and replica high-pitched squeaks. Some are even impregnated with catnip to make them even more attractive. Almost no cat can resist the urge to chase a red dot, and a simple laser pointer can provide hours of entertainment for both you and your pet. There are a few variations on the theme – some produce a specific shape, such as a mouse, while others just a simple red dot. In my experience, nothing beats the basic red dot! Cats are very playful creatures, and love to hide and pounce. A cat tunnel toy gives them the perfect environment to explore this behaviour. Look for tunnels that have supports built in to prevent them from collapsing when your cat jumps or sits on them. Tunnels can come in various shapes and sizes – from a simple short tunnel, to larger versions with 3 or more entrances. Anyone who has a cat will know how he or she can be very picky about what toys they play with. A toy which they love one week can be ignored the next, so how do you keep things interesting for them? One tip is to tidy away any cat toy they aren’t using, and rotate their toys every so often. Sometimes seeing a toy they haven’t played with for a while can get them excited about it again. Another tip is to be creative when playing with old toys. Cats are natural hunters, so place toys in a way that appeals to their hunting instinct. If your cat enjoys catnip, then don’t forget to occasionally refresh the catnip on their toys. The effect of catnip can fade over time, but it’s easy to refresh the smell. The easiest way is with refillable catnip cat toys, which have a little pouch for the catnip. Simply replace or add fresh catnip and seal up the pouch again. For the toys that don’t have this feature, you can simply spray with catnip spray or place the toys in a sealed container with a little bit of fresh catnip. Just like young children, cats often prefer the box or packaging to the actual toy inside. Sometimes very simple toys can provide the most entertainment – for example scrunched up sweet wrappers (Quality Street sweets are really good for this), cardboard boxes and paper bags. If you give your cat a bag to play with, always make sure they can’t get trapped in the handles. The Acticat Cat Play Tunnel from Ancol is slightly different to most cat tunnels in that it has three rather than the usual two entrances. The Y-shaped design means there are 3 x 50cm long tunnels, joined by a centre piece with its own access hole. Each tunnel is 25cm in diameter, so this tunnel should be big enough for the majority of cats. The tunnel is made from a crinkle material that is popular with cats, but can be quite noisy when they play. Although it does take up a fair bit of space when extended, you can fold it up when not in use. 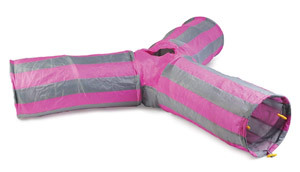 This toy is also suitable for rabbits, and any other pet who enjoys playing in a tunnel! The Catit Design Senses 2.0 Play Circuit is an updated version of a popular toy. This new version is green in colour, to differentiate it from the original blue version. It consists of 5 track pieces which can easily be assembled in many different combinations. The cover has cut-outs in it so your cat can swat the ball along the track. The track pieces are still compatible with old circuits, so you can use this set to add to an existing track. If you’d prefer a track with ups and downs, then the Senses 2.0 Wave Circuit is the one to go for with its high and low sections. Or if you want something larger, then the Senses 2.0 Super Circuit combines both the Play Circuit and Wave Circuit to create the ultimate set. For added excitement, you can even buy a light-up ball that illuminates when your cat bats it! The Catit Play-n-Scratch Cat Toy combines two really good cat toys into one design. It consists of a circular track with a ball in it, and also a corrugated cardboard scratch pad in the centre. There is also a pom pom mounted on a spring for additional fun! The scratch pad is reversible, and replacements are available to buy online. It also comes with some catnip to sprinkle on the pad to make it even more irresistible to cats. With a diameter of 14 inches, it’s big enough to be entertaining and small enough to place anywhere in your home. 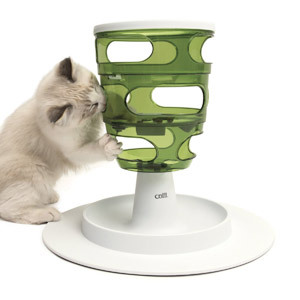 The Catit Senses Food Tree is a new version of their popular Food Maze toy. This cat treat toy has a new and improved design which stimulates your cat’s natural hunting behaviour. The way the toy works is by making your cat work for their food, as they have to nudge it through various openings before they can eat it. This helps entertain your cat, and keep them active. 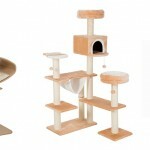 It has 3 different settings so you can vary the difficulty, and the design makes it impossible for your cat to cheat! The wide base helps keep it stable, and also acts as a collector tray to prevent food from spilling. It’s also easy to dismantle for easy cleaning. The Frolicat Bolt from PetSafe is a laser cat toy with a difference! Rather than relying on you pointing the laser, the Bolt uses a motorised mirror to randomly shine the laser. You can also pick up the toy and aim it manually for a more interactive playtime. 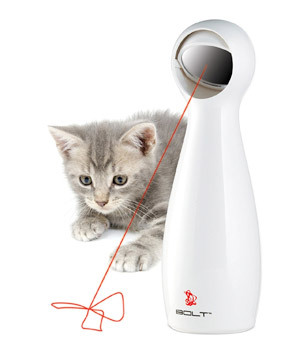 The Frolicat Multi-Laser Cat Toy is a more advanced toy than the Bolt, and features two lasers and 360-degree rotation to provide even more entertainment. Both toys have an automatic cut-off, which stops the toy after 15 minutes of play. 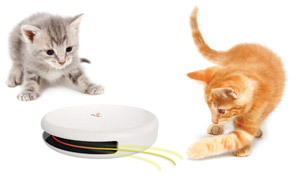 The FroliCat FLIK Automatic Cat Teaser toy is another in the range of toys from PetSafe. This one is a circular cat toy that automatically flicks and hides a piece of string for your cat to attack. It has rubber feet on the bottom to help prevent it sliding, especially useful when your cat grabs the string! Having seen this in action, it seems to stand up to even the most energetic cats trying to pull out the string. Similar to other FroliCat cat toys, it has a 15 minute timer so will shut off automatically. As this has moving parts, I would recommend that you always keep an eye on your cat when playing with this toy. The Funny Butterfly Cat Toy is a battery-powered cat toy which flutters and flies around in a random way. 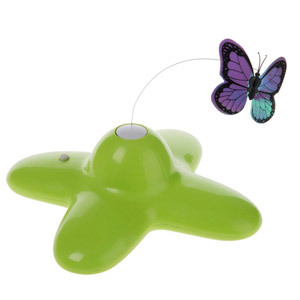 With a gentle push after pressing the On-button, the butterfly starts to rotate around the base, and also vibrates gently to give a life-like movement. There is an automatic timer which switches off the toy after 3 minutes. The toy also comes with spare butterflies, and you can buy more if needed. As with other automatic cat toys that have moving parts, it’s recommended that you always supervise your pet when they play. 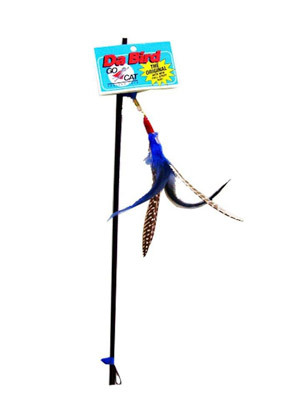 The Da Bird Feather Cat Toy from Go-Cat is probably the best feather cat toy you can buy! There’s something about it that makes it utterly irresistible to cats, and from personal experience other similar toys just don’t match up. The feather teaser is made from real feathers, and is designed to spin through the air. This makes it look, sound and feel like a real bird in flight to your cat. In fact, these are so good that you will need to hide the toy when you’re not using it! The Kickeroo Cat Toy from KONG is one of their best known cat toys. It’s designed for cats to grab it with their front paws, and attack it with their back paws. The plush tail makes it look like prey, and will encourage your cat to stalk and attack the toy. It also contains catnip to make it even more appealing! It also makes a perfect cushion for sleepy cats to snuggle up to after their playtime. A smaller version is available for kittens. 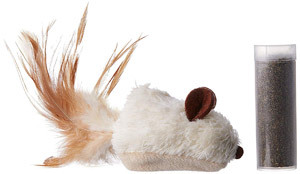 This Catnip Feather Mouse Cat Toy from KONG has pretty much everything you need in a mouse cat toy! 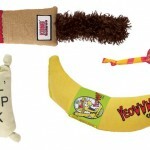 KONG are also known for making good quality pet toys, so you can be sure this will stand up to plenty of play time. It combines a soft mouse toy with a feather, and has a special compartment in the belly of the mouse which contains catnip. As the catnip wears out, you can easily add or replace it with the fresh catnip supplied with the toy. If a mouse isn’t to your cat’s fancy, then this range of toy comes in other designs including Hedgehog, Carrot and Beaver. Laser pointers make awesome toys for playing with your cat, and you can find them pretty much anywhere. This YAMI 3-in-1 laser pointer has a few extra features that make it stand out from the crowd. As well as the red laser light, it also has a white LED which is useful as a small torch. In addition, it has an Ultraviolet (UV) light, which could be useful for finding splashes of cat urine. Another feature which will make this more comfortable to use is the on/off switch. 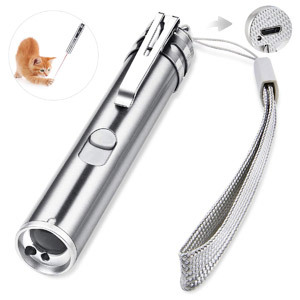 Lots of laser pointers require you to keep the power switch pressed down to operate, however with this one you simply slide it to the on position, and it stays on. No more sore thumbs! The final useful feature is that you can re-charge it via a USB port, so no need to buy replacement batteries! The SlimCat Feed Ball from PetSafe is another cat treat toy, designed to make your cat work for their treats. It’s basically a small plastic ball with holes in the side. 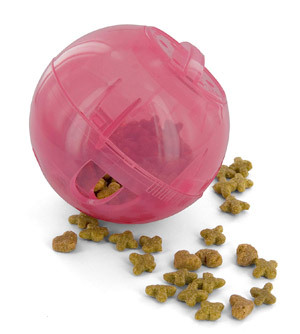 You fill the ball with treats, and as your cat plays with the ball, the food falls out of the holes. It’s adjustable too, so with a simple twist of the ball, you can make it easier or harder. This type of toy has two benefits – firstly it gives your cat something to play and entertain themselves with. And secondly, they will eat slower which will help with digestion and keeping them at the optimum weight. 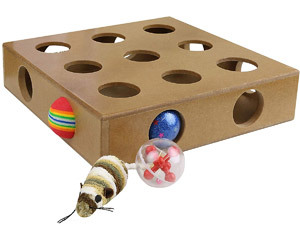 This Interactive Peek & Play Cat Toy Box from Me & My Pets is a wooden box with peep holes. Cats are curious and playful creatures, and love to try to get things that are hidden away. The peep holes in the toy are big enough for your cat to get their paw into, and just about big enough so they can get the toys out with some effort. The toy includes 4 toys – and you can add to or replace these with your own. You could even hide cat treats in the toy for added fun. Another mouse toy in our list, this one has sounds and LED eyes! Unlike many of the mouse cat toys available to buy, this one has an in-build micro-chip squeak which makes a high-pitched noise when you move it. The LED eyes are also activated by movement, so light up as well. 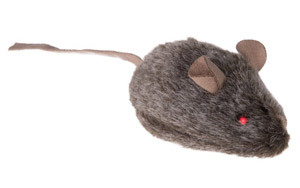 The fake fur material also makes this toy mouse seem natural, along with the little tail. At under £2, this toy is excellent value for money too! 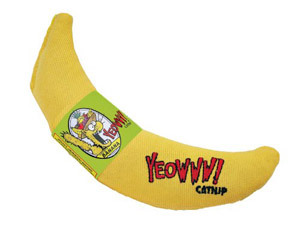 There are many catnip toys available to buy, but the Yeowww Catnip Banana is one of my favourites. Yeowww use only organically grown American catnip in their cat toys, and this one is packed full of it. The toy itself is made from heavy duty cotton, and uses natural vegetable or soy based colours, so is safe for your pet. At 7 inches long, it’s a decent size and large enough for cats to cuddle up to, or “attack” with their back legs while holding it with their front paws. 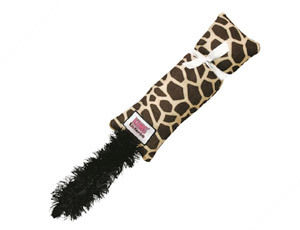 From experience, these toys are very long lasting and if your cat likes catnip, they will love these catnip cat toys!